It’s logical for most people to demand odor control and easy cleanup out of their cat litter. The problem is that many cat owners aren’t aware of just how important a litter’s texture is to guaranteeing hassle-free cat care. Selecting the litter with the right granule size is crucial in eliminating dust, preventing it from being embedded in a cat’s hair and avoiding litter from being tracked throughout the home. What is granule size? Wellsimply putit’s the size of the tiny particles that constitute different types of cat litter. Some litters contain large granules that look like animal feed pellets while others are so fine they have been compared to sawdust. Simplifying the overall litter box experience requires the selection of a litter whose consistency strikes the perfect balance between controlling odor and making cleanup simple. Many litter brands have attempted to please pet owners and their cats by offering “lightweight” litters that consist of extremely fine granules, but this approach fails to hit the mark when it comes to making cleanup simple. Tiny granules are more likely to stick to a cat’s paws, which can result in the litter being tracked out of the box and throughout the home. Fine litter is also more likely to produce dust that becomes embedded in a cat’s hair. Constantly sweeping up tracked litter and dusting off cats isn’t the easiest way to tackle the litter box job. Other brands offer litters with large granules in an attempt to avoid the litter from being tracked around the home. The problem with this approach is that these litters have an abrasive feel that can be unappealing to felines. It’s well documented that a cat’s paw pads are loaded with touch receptors that are hypersensitive to texture, temperature and density. If a cat is unwilling to a litter, it isn’t making life easier for anyone. World’s Best Cat Litter™ offers the perfect balance when it comes to litter granule size. All three of our all natural clumping litters are specifically formulated with granules that are small enough to be soft on cat’s paws and large enough to minimize the amount of litter that sticks to a cat or is tracked outside the box. It’s pleasing to cats and eliminates the hassle for their owners! 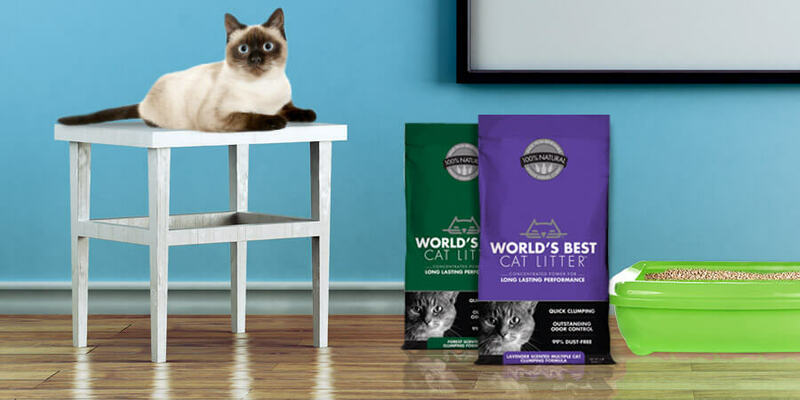 Does World’s Best Cat Litter™ promote hassle-free cat care in your home? Tell us about it!